We care about the products we fulfill because we produced it. Our employees take great pride in the fact that we are both the manufacturer and then fulfillment provider for our customers, which allows us to deliver one simple solution for your color marketing supply chain. Our Warehouse Management System is scalable to whatever your project requires. No system is too large or too small. We ship thousands of orders weekly direct to retail locations, professional architectural firms, and the graphic design community. We're here to help you find your favorite colors for the task at hand! 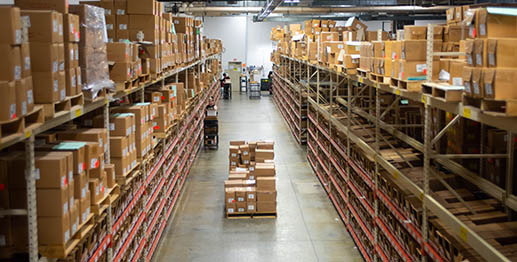 Warehousing & DistributionWe offer state of the art fulfillment, warehousing, and distribution. Inventory ManagementWe manufacture, inventory, and monitor thousands of products.